Water is important — no critical — to us. Perhaps even more so when we’re traveling. So how much should you drink? Today’s wisdom, per a study by The National Academies of Sciences, Engineering, and Medicine determined the old rule of 8 8-oz glasses wasn’t helpful and now says 2.7 liters for women or 3.7 liters for men. It seems that when this research came out, quite a few websites picked up on it. For example, the Dr. Oz Show Blog and Self magazine Nov 2017. Here’s the Mayo Clinic article: The Mayo Clinic article “Water: How much should you drink every day?” However, I can’t find the actual National Academies statement. Opinions vary as to whether other beverages count as water intake but everything I’ve read says that water in foods does count. So rather than general rules, let’s look at how you know you need a drink. This 10-minute Bright Side video does a good job of showing how to know we need more water and what water does for us. While you’re traveling you may not think you’re exercising, but unless you’re taking taxis everywhere, all the walking you’re doing counts. It’s always recommended to drink some water before and during exercise, so start your day with water, drink before you head out, and as you’re out and about. This article, Hydration for Athletes, provides some good guidelines. In 2012, after much research, I selected a SteriPEN Ultraviolet (UV) Light Purifier to travel with as I was going to Central America and possibly South America and I definitely wanted a good water purifier, not just a filter. I also found that where people lived with questionable water, they had a ceramic water cleaner in their homes. I drank that water. While in Europe, Eastern Europe, and Israel, I didn’t worry about water. In Poland locals who lived through the Soviet times didn’t trust the pipes in older homes so they drank only bottled water but I drank tap water and was fine. (I don’t like what the plastic does to us.) I have never gotten sick from water in this millennium. This REI article, How to Choose a Water Filter or Purifier, may be helpful to you. I’m still a fan of a SteriPEN for travel and you can read and learn at their site. Start with the Learn menu. I’ll start you off with the top item under that Learn menu. Have a look at the PURE+™ as it’s the smallest and it’s rechargeable. This lamp will do 5,000 ½-liter treatments which is 6.85 liters a day for 365 days, so it should last you for a year or two. I also hear the Katadyn BeFree Water Filtration is great for travelers. Again, there’s much information there under the Water Know-How menu. I suggest you start here and learn the what and where of contamination. Don’t forget to consider the length of your trip as you may need replacement filters. As I write this I see that SteriPEN is actually part of the Katadyn Group now. You’ll see cross-over in the info I’ve recommended. With their new connection, it may be easier to discover what is best for you to travel with. The common way to carry water is to purchase and carry bottled water but such plastics are harmful to your body and the planet. I prefer having a collapsible container to carry my water. A travel sized SteriPEN would work well with either of these, I think. 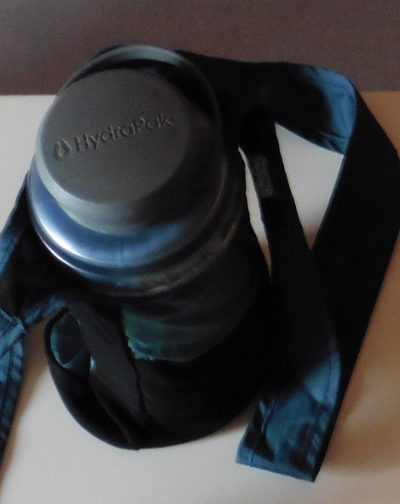 My current water bottle of choice is the 1-liter Stash by HydraPak as long as it’s used with their optional Watergate (which I haven’t gotten to write about yet.). I haven’t seen or tried their Stow bottle that’s also on that page. I think it’s newer and it absolutely promising. The 750ml Stash by HydraPak works well with the Katadyn BeFree refills, I’m told by HydraPak, as the opening is the right size. The other bottle I might consider is the Hydaway, once they make a larger and lighter version. I’ve spoken with Hydaway about this and have hope for this in the future so keep your eyes out for it. I also like having my ChicoBag bottle sling to make carrying it easy. I have not used either product I link to. My suggestions are by research and other people’s words only. I receive no compensation if you purchase. If you want to be healthy for your upcoming travels, drink enough water. If you’re already traveling and want to stay healthy, drink enough water. If you’re going where the water may be contaminated, pack a good water purifier. And… if you have experiences or info to share with fellow travelers, please tell us in the comments below. We bought Water To Go filtration bottles for our trip to Europe. My son was diagnosed with high lead levels last year and we’ve worked hard to eliminate it. I didn’t want to risk drinking tap water from old buildings that might have old plumbing pipes with lead soldering. We also avoid water with chlorine and fluoride. These were the only portable bottles I could find that filter out lead. There’s an old cabin not far from me where the whole family died of cholera about 50 or so years ago. They’re buried on a hill behind the cabin. The mom, the dad, and all 6 kids. It’s a sobering sight to see all those graves. Wow, Vicki. You give us more good reasons to purify or filter our water as we travel and drink/eat in places where the water is unknown to us! Yes, those graves must be a constant reminder to be careful. Thank you!